I’ve been making batches of these sweet holiday hearts based on the Scandinavian Heart tutorial by Charlotte Warr Anderson. 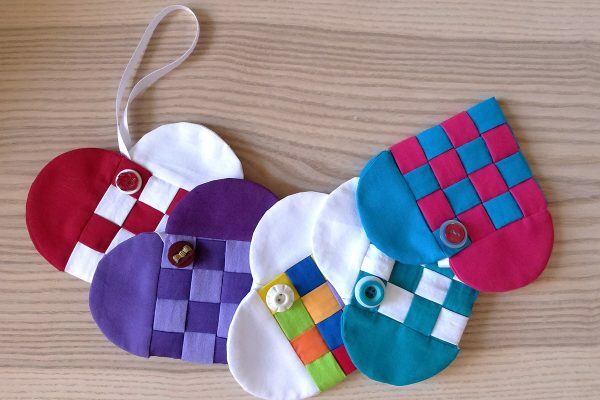 They are clever little pockets, perfect for filling with small gifts for any occasion. 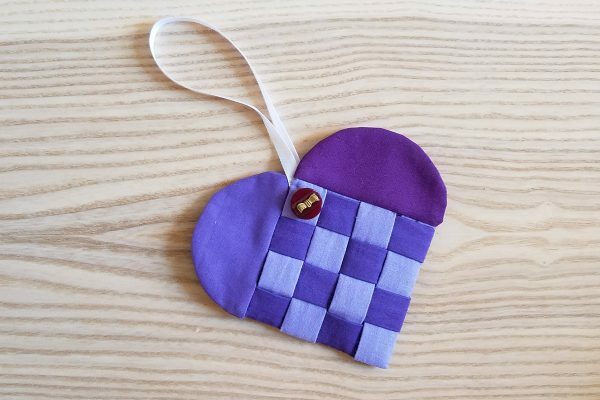 Visit the Scandinavian Heart post here at WeAllSew to find the pattern and full tutorial. 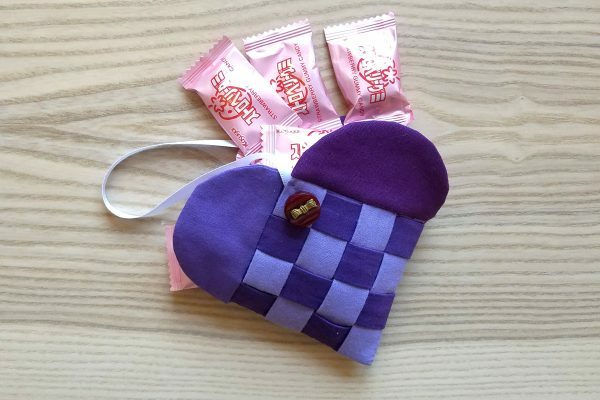 I modified the tutorial to use solid colored 100% cotton fabrics, and added a button to trim each heart. Accuracy is really important with this project! 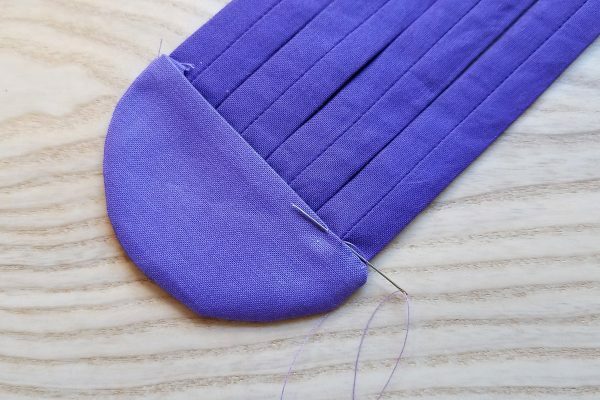 The long strips and the half circles need to be stitched with an exact quarter-inch seam. 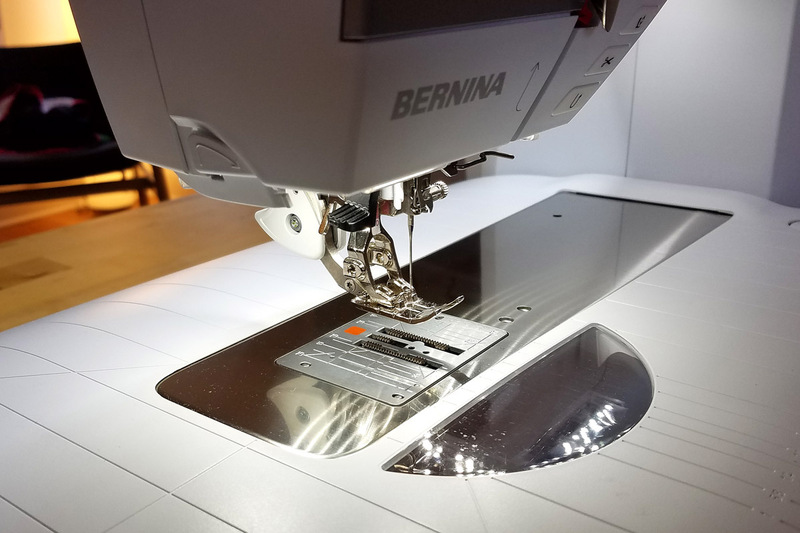 To help with getting that precise quarter-inch seam I used the straight stitch needle plate, the Patchwork foot #97D with Dual Feed, and I used a fresh needle in my B 770 QE. If you are using a high-quality cotton (like quilting cotton solids), there’s no need to use any interfacing, it’s stable enough to sew without stabilizing. I also used a bit of spray starch during construction to give the fabric a little extra body. 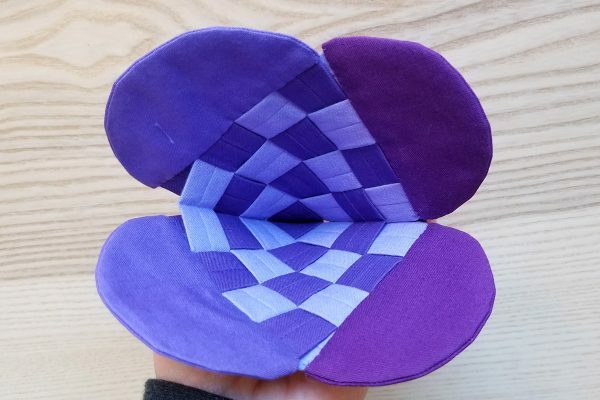 When stitching the half circles, I shortened the stitch length to about 1.5 so I could sew around the curve smoothly. 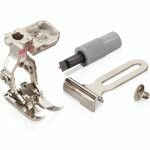 I also used the needle down feature, and set the presser foot on my B 770 QE to hover with the needle down. This allowed me to pivot around the half circle as needed for a smoother line of stitching. I followed the tutorial step-by-step, but instead of straight stitching the opening on the half circle closed by machine, I used hand stitches. This means no stitches showing when your heart is finished. The hearts look great using two different colors, but I wanted to try something a little different. I cut the half-circles and strips from four different purples and blues for this heart to see how it would look. Here’s what the inside looks like when it’s all woven together. I added a 10″ piece of plain ribbon to hang the holiday hearts with a quick hand stitch on the inside. I also decided each heart could use a little bit of flair, and added a button or two to match colors on each heart. I love these little hearts! 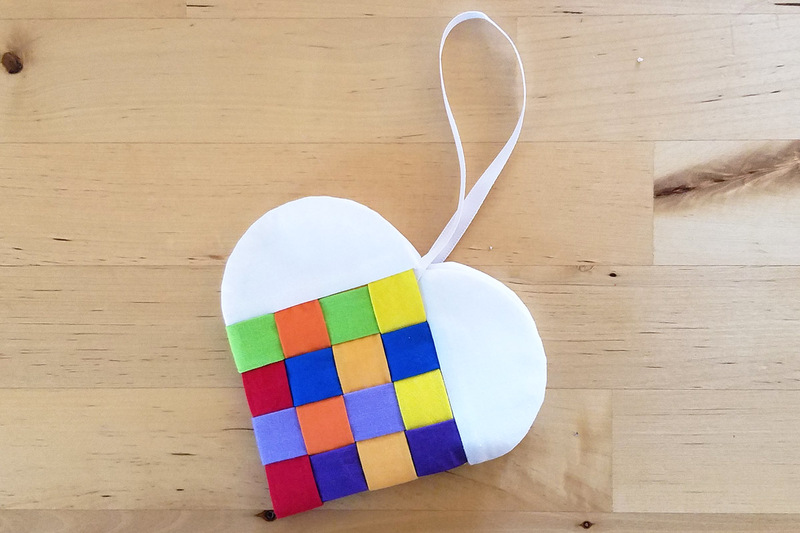 I wondered, what would one of these hearts look like with multicolored strips? 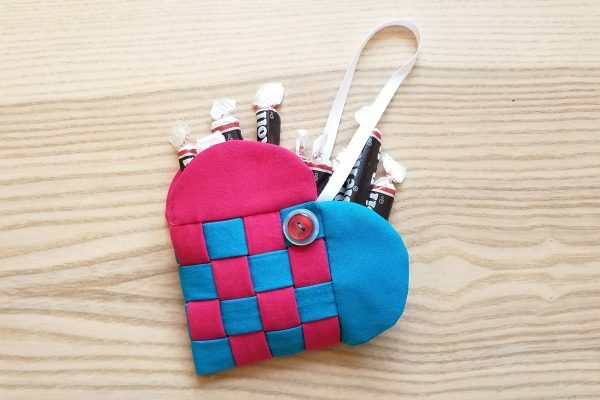 The hearts are the perfect size to hold a handful of favorite candy. 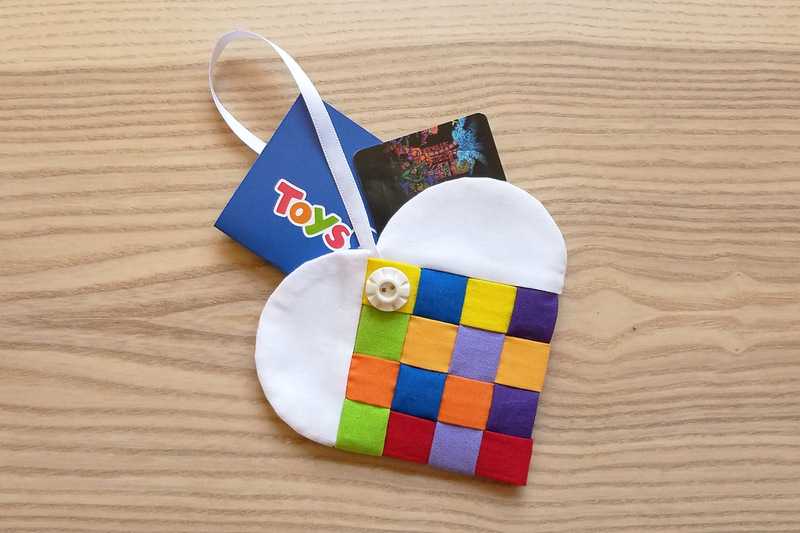 Or use a heart to hold a gift card or two! 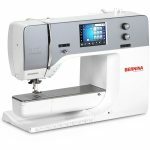 You could even fill a heart with thread, a small pair of snips, and a seam ripper and keep it by your sewing machine. 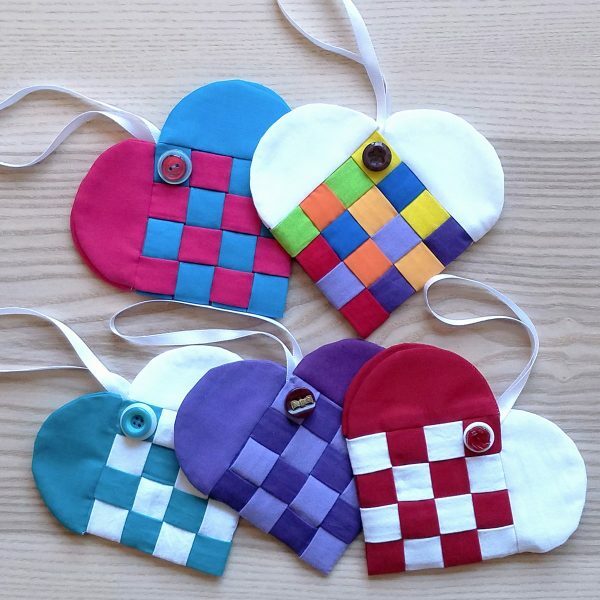 Half the fun of making these hearts is playing with the color combinations! If you decide to make some holiday hearts, please share with all of our WeAllSew readers! 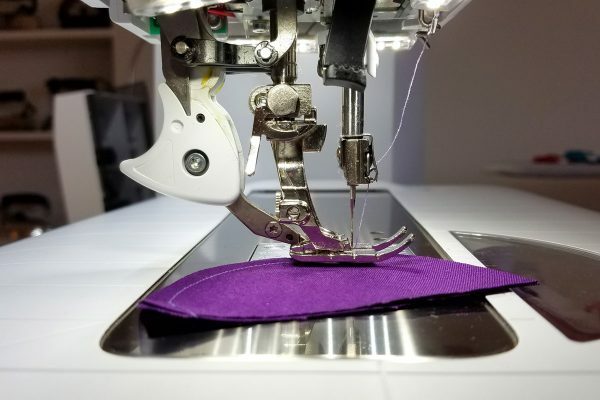 Just post your project photos in the WeAllSew Community section, and be sure to include a description of your project. I love these! I think I might just have to make some !! Hello debbiew, I followed the original tutorial for the Scandinavian Heart linked above and was able to weave the hearts together. 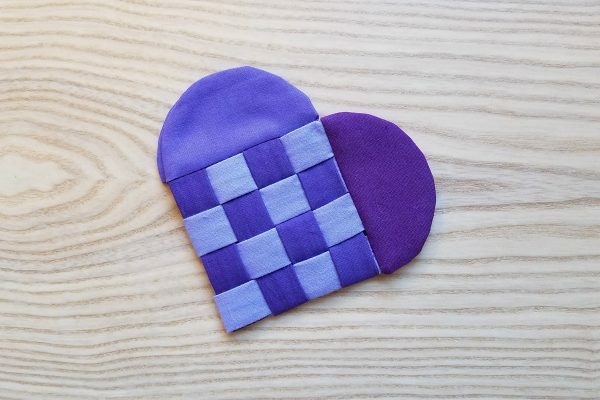 Were you able to click to the original tutorial to see how to make these hearts? Your hearts are really cute! 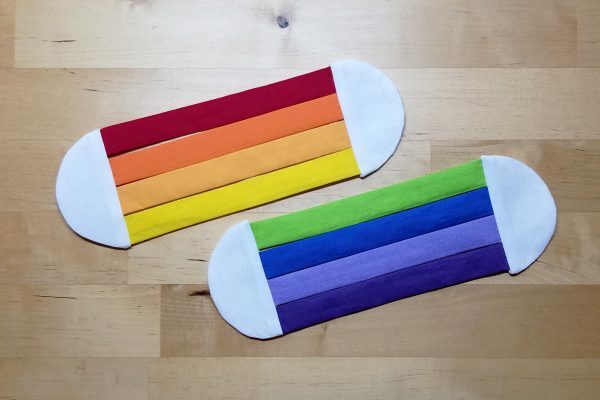 I love the multi-colored one. i lqve this thanks, how doi get the pattern?